After George Papadopoulos pleaded guilty to lying to the FBI, his fiance said he could be the John Dean of the Mueller investigation. That was then. WASHINGTON — Six months ago, George Papadopoulos's fiancée was making the rounds in the news media with a disquieting message for Trump supporters. "I used to compare him to John Dean, (but) I never meant to make this comparison in the sense that it would lead to the president's impeachment," she said. Asked if she believed her husband would go to prison, she answered, "I trust and hope and I ask President Trump to pardon him — I hope he will." In an email to NBC News, Mangiante denied that she had changed her portrayal of her husband's situation. "I never suggested the parallel to John Dean to suggest Trump impeachment. I suggested that because he is young and has been the target of many set-ups that are likely to put light on something major." She added that it was "simply not the case" that Papadopoulos was involved in a collusion scheme with Russia. Mangiante's recent comments raise questions about the nature and extent of her husband's cooperation with the Mueller probe. She declined to answer questions on the record for this article. Peter Carr, a spokesman for Mueller, declined to comment. In an article published Monday by the conservative Daily Caller, Mangiante said her husband only pleaded guilty because prosecutors threatened to charge him with acting as an illegal agent of the Israeli government. He had worked closely with Israeli officials and their lobbyists in the U.S. on energy policy as an intern with the conservative Hudson Institute. Papadopoulos, a Chicago native, was little known when Mueller's office released documents in October revealing that he had secretly pleaded guilty to lying to the FBI — and was cooperating. The court documents in his case said he lied about his interactions with a professor — later identified as U.K.-based Maltese professor Joseph Mifsud — whom the FBI suggested was an agent of Russian intelligence. The court documents say Papadopoulos continued to communicate with the professor, seeking to enlist his help in setting up a meeting between the Trump campaign and the Russian government. Documents released by Congress say that the FBI investigation into possible Trump campaign collusion with Russia began after the FBI learned about that offer to Papadopoulos. The FBI got a tip from Alexander Downer, a former Australian diplomat, who says Papadopoulos told him about the Russian offer of emails during drinks at a London wine bar in May 2016. The offer of emails has long been seen as a key piece of evidence of possible collusion. But on Monday night, Mangiante said on Fox that it wasn't anything of the sort. Mangiante, who herself worked at one point for Mifsud, said the professor was talking about the Clinton email issue that was already in the news — the former secretary of state's use of a private email server. "He was talking casually about information that was already in the public domain at the time that they met," she said. "It was about the emails of Hillary Clinton, not about the DNC emails." Papadopoulos's plea agreement says that he lied to the FBI about the timing and nature of the encounter. "In truth and in fact, however," says the plea agreement, "defendant PAPADOPOULOS understood the Professor to have substantial connections to high-level Russian government officials and that the Professor spoke with some of those officials in Moscow before telling defendant PAPADOPOULOS about the`dirt.' "
Papadopoulos met during the campaign with an American professor who has since been identified by several news organizations as an FBI source. Papadopoulos has told associates that he viewed his encounter with the professor, Stefan Halper, with suspicion, two sources familiar with his story told NBC News. 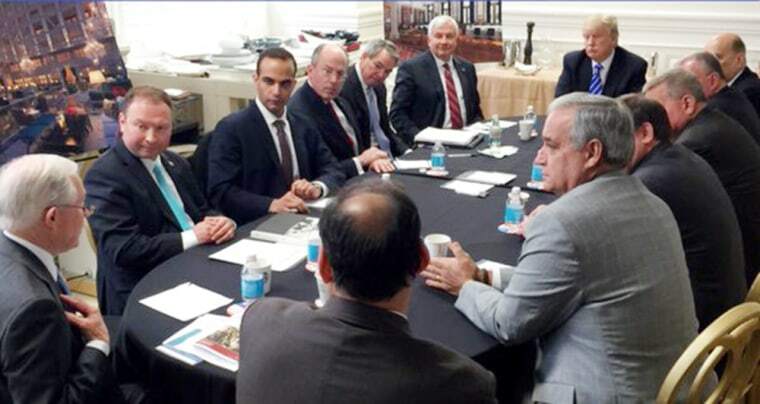 The sources said Papadopoulos described being summoned to England in September 2016 by Halper, who was offering to pay him to discuss energy issues involving Turkey, Israel and Cyprus, which was his area of expertise. "He has been approached by many different characters, let's say spies … not only Halper," Mangiante said on Fox Monday. "I'm sure he will be happy to share this information when the time is right." Papadopoulos was secretly arrested in July 2017, and has pleaded guilty to lying to the FBI in a January 2017 interview. He is now awaiting sentencing, and the extent and nature of his cooperation with Mueller's office remains a secret.